The Hugo Awards are given to the best science fiction or fantasy works of the previous year. Unfortunately, they've only been awarded since 1953. That's where this column comes in — Jess Nevins will be awarding honorary Hugo Awards to the best novels of the Victorian era... and beyond. 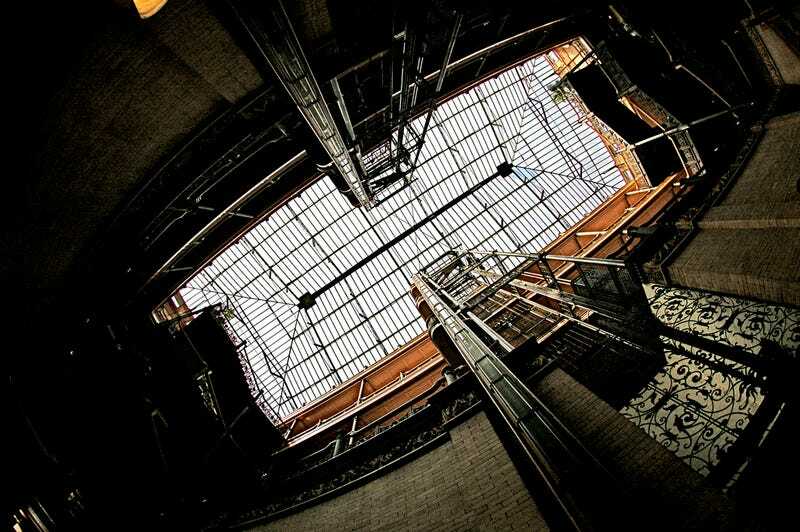 Top image: The Bradbury Building, inspired by Bellamy's Looking Backward, photo by Ann Althouse on Flickr. One doesn't think of 1888 as being a particularly good year for science fiction. Apart from the one big name on the novels list, only one of the other writers is particularly well-known, and none of the other novels are remembered. But there are no less than 13 novels that could have made the final ballot for the Novels Hugo. For the year as a whole, there were a number of novels that were overtly science fictional, rather than science fantasy or Lost Race or heroic fantasy. Basically, 1888 was the best year yet for science fiction. Genres as we know them now, as publishing categories, hadn't been invented yet, but everyone — writers, critics, and fans — knew that science fiction (better known at this time as "scientific romance") was something different from ordinary fiction. 1888 was the first year in which outside critics could point to the genre's output and say that the genre as a whole had the vitality of other genres. And as we'll see, numerically the output of 1888 is around half of what 1889 will be. Unusually, there were far more good novels published in 1888 than there were good short stories, and the competition for the novel Hugo is much, much tighter than for the short story Hugo. 13 novels would have received votes; 7 were good enough to make the final ballot. After several rounds of balloting (see here for the Hugo balloting process) the final five would have been: Edward Bellamy's Looking Backward, Walter Besant's The Inner House, Theophile Gautier's Avatar, Joseph Nicholson's Thoth, and Mrs. Riddell's The Nun's Curse. Looking Backward would have been awarded the Hugo. ...it was followed by more than one hundred continuations, refutations, reaffirmations, and parodies; by Bellamy Clubs that tried to bring its principles into active politics; and by several practical communes. Today, one can only find these phenomena astonishing, perhaps more indicative of the tremendous malaise about contemporary political economics than intelligent examination of Bellamy's ideas. Bellamy clearly put a lot of thought into the socialist utopia of Looking Backward, but how does it hold up as fiction? I think it's more readable than many 19th century utopias, but the critical flaw of most utopias is that the author's desire to deliver information about the utopia usually trumps the necessity of creating realistic dialogue and characterization, and that's the case with Looking Backward. The thicker, slower prose style of the 1860s doesn't help matters, either. Nonetheless, Looking Backward was a runaway best-seller and hugely (and immediately) influential, and there can be no argument that it would have won the 1888 Hugo. Walter Besant (1836-1901) was, in the words of critic John Sutherland, "a perfect Victorian...the avatar of the versatile man of letters in the century: scholar, novelist, philanthropist, translator, journalist, historian and organiser of his fellow writers." We shouldn't be surprised to see him writing science fiction. This is 1888, before genres became ghettos, a time when mainstream writers, like Besant, felt comfortable writing works of the fantastic — a decade later Henry James himself would correspond with H.G. Wells about writing a sequel to War of the Worlds. Besant had already written one work of science fiction, The Revolt of Man (1882), a dystopia in which feminism has ruined 22nd century Great Britain. The Inner House is another far-future dystopia, this time dealing with the dire consequences of widespread immortality. But despite its theme it's surprisingly sprightly and entertaining. The Inner House is still in the Victorian style, but late-Victorian, with an emphasis on wit, dialogue, and a lightness of narration to accompany its ideas. If The Inner House is too long for its central concept, it's nonetheless an enjoyable read. I was unfamiliar with Besant's work before now, but I'm certainly going to search it out. Gautier (1811-1872) was a French poet, novelist and critic, and a leader of the French Romantic movement. He was one of the major figures in French letters for almost fifty years, and his "La Morte Amoureuse" (1836) is on the short list of best horror stories of the 19th century and is virtually perfect. But as was the case with many other Continental writers, much of Gautier's work was not translated into English during his lifetime. The novel Avatar is one of those. It's about unrequited love and identity exchange, told in a light, ironic fashion. Avatar has some dark humor going on — only its mad scientist gets a happy ending — and the translation is slightly stiff, but its arch style makes it fun reading nonetheless. Like Besant, Gautier would get votes simply on the strength of his name, but like Besant Gautier would deserve those votes. Nicholson (1850-1927) was one of the foremost economists of the Victorian era and is primarily known for his anti-Marxist, anti-socialist, statistics-driven The Principles of Political Economy. On the side he wrote the occasional novel. Thoth is the best-known of these, although "best-known" is hardly accurate: it only gets around 4460 hits on Google. To the critics, this is a shame, since they see Thoth as the best Victorian sf novel that most sf fans have never heard of. John Clute calls Thoth "impressive," and E.F. Bleiler says it is "one of the major science-fiction novels of the nineteenth century." Thoth is a Lost Race novel involving a high-tech Egyptian city-state, founded around 2500 B.C.E. by Thoth the First, and how in 435 B.C.E. an Athenian woman brings about its downfall. Thoth certainly has imagination: in addition to the Lost Race, it's got Pharaonic superscience, suspended animation (including every previous Thoth, back to the first), bio-engineered plagues, sleeping gas, self-propelled flying machines, genetic engineering (which produces slave races of giants and dwarfs), and a subway system. But Thoth isn't so much science fiction as one of the late-Victorian historical romances which so brightened the bookshelves of the 1880s and 1890s. Starting in the 1880s with J.H. Shorthouse's John Inglesant and the works of Robert Louis Stevenson, the historical romance experienced a new vogue as popular rather than as serious fiction. Thoth is closest to Gustave Flaubert's Salammbe (1862) and Leo Dessar's A Royal Enchantress (1900), with a heavy dose of Bulwer-Lytton's The Coming Race (1871). Thoth has the faux-antiquated dialogue of the former two as well as their this-happened-then-that-happened history-in-motion narrative style, but Nicholson stresses the psychology of his characters more than Flaubert, Dessar, or Bulwer-Lytton, albeit in short, dialogue-driven bursts. Thoth's denser descriptive style makes it less easy reading than The Inner House, but it's more imaginative. I think Bleiler and Clute are right: Thoth deserves to be better known and is one of the best science fiction novels of the century. In her prime Mrs. Riddell, nee Charlotte Cowan (1832-1906), was one of England's most successful and powerful novelists, renowned as the novelist of The City. She was also one of the two best Victorian authors of the supernatural; her Weird Stories (1882) is one of the most important supernatural story collections of the century, and her The Uninhabited House (1875) is arguably the best supernatural novel in the High Victorian style. Unfortunately, by 1888 she was on the decline, working desperately to pay off her late husband's debts. The Nun's Curse is a return to the mimetic — her realistic novels always sold better than her supernatural ones did — but with a light overlay of the fantastic: a curse by a dying nun blights generations of the Conway family, and the current Conway tries to defy the curse. But Riddell hints that the traditional family misfortunes have at least as much to do with human irresponsibility and bad character as any supernatural source. The Nun's Curse lacks the pith of Riddell's shorter works and at times reads as if she was paid by the word, but it has much well-researched Irish color, Riddell's usual strong characterization, some very good turns of phrase, and an enjoyable narrative voice. Two novels which could easily have made the final list are Julian Hawthorne's The Professor's Sister, a metaphysical fantasy which is probably Hawthorne's best long work, and Charles Montague and Clement Hammond's The Doctor's Mistake, a reincarnation/identity transfer story whose splendid final act changes the novel from entertaining metaphysical fantasy into wonderfully creepy proto-Lovecraftian horror. Other novels receiving votes: Pierton Dooner's Last Days of the Republic (reprehensible Yellow Peril future history, but likely quite popular with many American award voters); W. Grove's A Mexican Mystery (very entertaining murderous-sentient-train story); Edgar Henry's '89 (repugnant South-secedes, capitalism-is-bad, racism-is-good novel, probably very popular with many American award voters); David Johnstone's The Mountain Kingdom (high quality Boy's Own adventure); Wallace Peck's The Golden Age of Patents (very amusing "souvenir of the 1895 Railway Convention," stressing near-future inventions like the burglar bed and diving suits for underwater farms); and Percy Westall's Mr. Fortescue (good quality faux-Haggard). A disappointing let-down after the glories of 1887. Ambrose Bierce is at the height of his powers and San Francisco reputation, but his stories this year are primarily vignettes, and it's a leap of faith to even assume that Hugo voters would know about Bierce's fiction, as he was primarily known in his lifetime as a journalist, not a fiction writer. In 1888 Oscar Wilde put out The Happy Prince and Other Tales, a collection of fables which are well-told, as one would expect from Wilde, but just aren't at the same level as his short stories. That leaves a final five which are lackluster, by which I mean they are entertaining, but none even come close to classic status. The Hugo short list for 1888 short stories would have been Richard Garnett's "The Demon Pope," Ernest Harmer's "Professor Bommsenn's Germ," Arthur Machen's "Strange Story of a Red Jar," Mrs. Riddell's "The Last of Squire Ennismore," and Frank Stockton's "Amost Kilbright." For lack of a better choice "The Last of Squire Ennismore" would have won the award. Garnett (1835-1906) was a scholar, an author, and a librarian with the British Museum. He is best known for his collection Twilight of the Gods (1888), in which "The Demon Pope" appeared. "The Demon Pope" is an anecdote from the life of Pope Sylvester II in which the Pope makes a bargain with the devil, and the devil quickly regrets it. "The Demon Pope" is emblematic of Twilight of the Gods as a whole: erudite, light-hearted, ironic, witty, and breezily written. It's quite charming and has not aged at all. It's not a super-serious tragedy or Art, but it's great fun nonetheless. It's a souffle rather than a stew — but who doesn't enjoy a good souffle now and again? Harmer (c. 1863-?) was an academic whose primary work was in art and archaeology. "Professor Bommsenn's Germ" seems to have been his only work of fiction. It's a story about a professor who succeeds in isolating "primordial germs" and develops a method for growing them at speed. Unfortunately, the professor does not think through the consequences of his discoveries, and matters end badly for all concerned. "Professor Bommsenn's Germ" is a neat little spoof on late Victorian biological theory and learning, as well as a kind of proto-sf horror story. It's not immortal, but the story is skillfully realized and entertaining. That those are the only qualities needed to make the short list this year says all you need to know about 1888 in short fiction. Machen, née Arthur Llewellyn Jones (1863-1947), was a Welsh novelist, short story writer, and translator. He is well-regarded by connoisseurs of horror and supernatural fiction but not as well known outside the field as he deserves to be. The Chronicle of Clemendy was his first short story collection. "Strange Story of a Red Jar," the first story in the collection, is about a monk who finds an ancient jar full of wine from the Roman occupation. Drinking the wine brings about visions of bacchantes. Unfortunately, only 350 copies of The Chronicle of Clemendy were printed, and I was unable to read it or "Strange Story of a Red Jar." But judging from the contemporary reaction, it was well thought of, and E.F. Bleiler says of The Chronicle of Clemendy that it was "probably written to satisfy one of the affectations of the day, bowdlerized, sentimentalized Rabelais. Heavily tongue-in-cheek...amusing stories with a bookish joi de vivre." I feel safe in guessing "Red Jar" would have earned a Hugo nomination. More Mrs. Riddell, this time "The Last of Squire Ennismore," Irish folklore-horror about the terrible Squire Ennismore and his final fate. It is excellent, with an entertaining combination of pith, humor, and folklore. It's also told in a discursive and dialogue-driven fashion quite unlike a lot of contemporary horror, and Riddell uses implications and hints to good effect. "The Last of Squire Ennismore" may not be Riddell's best short story — I think "A Terrible Vengeance" is, which we'll see in 1889 — but it's good enough to win the Hugo for 1888. Stories receiving votes would include M.E. Braddon's "Revelation" (not her best work), Thomas Hardy's "The Withered Arm" (local color/folklore curse story which would get votes based solely on Hardy's name), Mrs. Molesworth's "Witnessed By Two" (a ghost story not up to her best), and H.G. Wells' "The Chronic Argonauts" (notable only as a dry run for The Time Traveller). Riddell's <a href="http://www.horrormasters.com/Text/a0306.pdf">"The Last of Squire Ennismore"